My attention span is like the beam of a lighthouse – narrowly focused, always roving. I write about a topic; it’s out of my head and I’m on to the next thing, and the old topic is over and finished, left behind in the dark. But sometimes, like the lighthouse, it comes back around for another look. 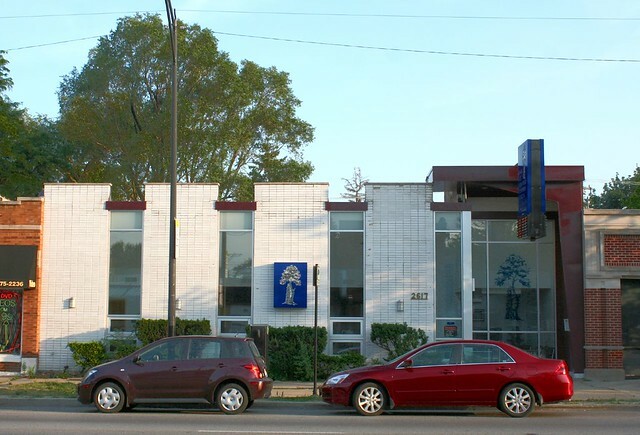 Case in point: I was surprised to look back on one of my earliest posts and discover just how little I’d written about Peterson Avenue and its amazing post-war architecture. St. Louis has its Hampton Avenue – a major commercial artery that seemingly sprung into existence all at once in the decades after World War II. And Chicago has Peterson Avenue – essentially the exact same thing, in northwest Chicago instead of southwest St. Louis. Both are at the start of early suburbia (or last-gasp urbanism); both are lined by a collection of one- and two-story buildings that individually range from forgettable to remarkable, and together form an astonishing collection of late Modernist architecture. The architectural integrity of the buildings on Peterson have been slipping in recent years, as original businesses close up and move out, or new owners decide to “freshen up” their aging buildings. 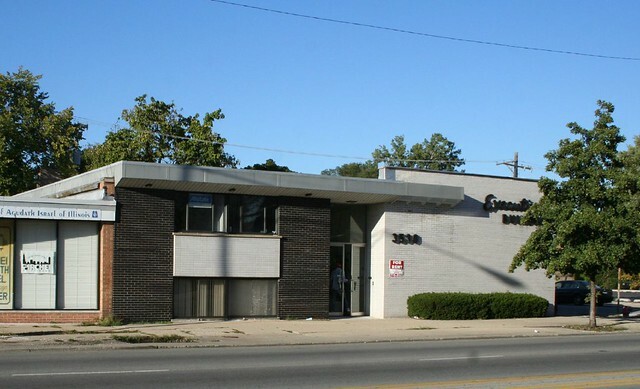 A prime example is the Executive Building, 3530 W. Peterson, built circa 1962 with 17 office suites inside. 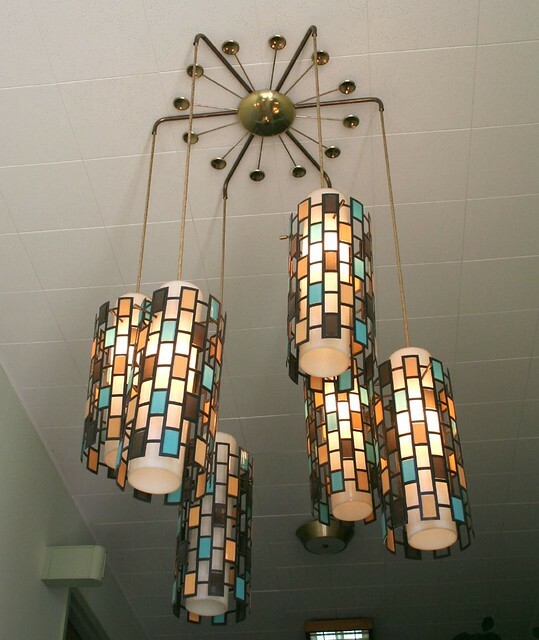 It contained one of the most wonderful hanging light fixtures to be found anywhere, a multi-colored confection. Now, it’s been replaced by something bland and gaudy. A recent realtor’s ad for the building claims it was “designed by [a] famous architect” but doesn’t specify who. 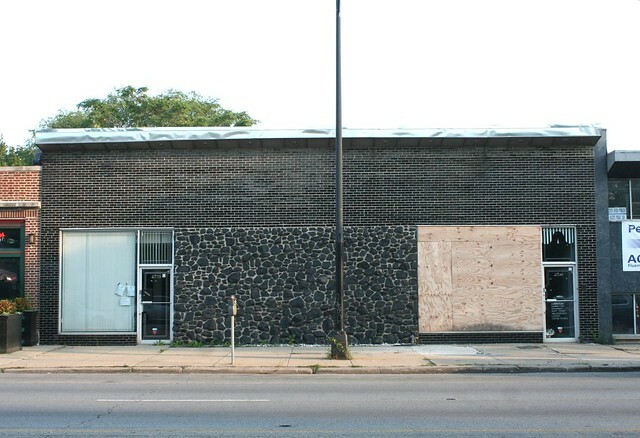 The building is currently “bank owned” and will be auctioned off 3 days after this writing, on August 9th. 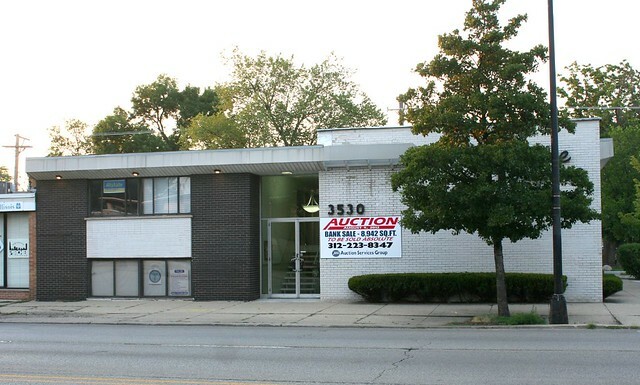 Further east, Shaw Electric Co. has recently departed the premises of their long-time home at 2539 W. Peterson Avenue. The building’s facade features a lower portion in rough-cut lava rock, with glossy black brick above; the company’s name and services offered a counterpoint in precisely spaced lettering. 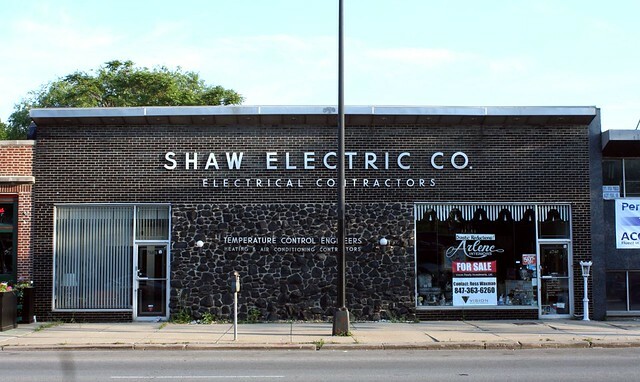 Shaw Electric was not the first business at this address; MinitMart grocery store ran ads in 1950, and the furniture and appliance dealer Gerry Moberg & Co. was here from 1952 until 1964. At that point they vanish from the listings; my guess is that the Shaw company bought the lot and built their building at that point. The building has two parts. 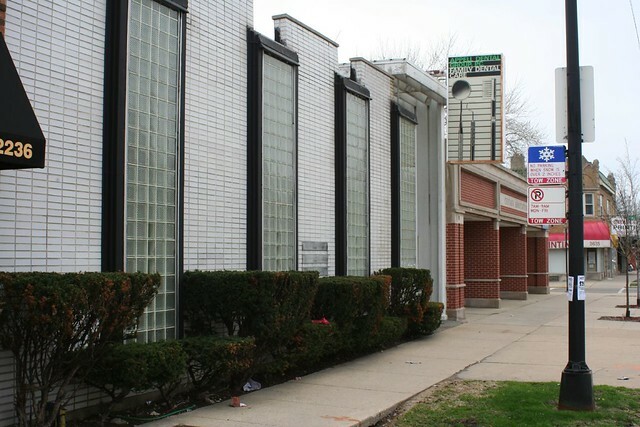 On the right, 2541 W. Peterson is a separate storefront that was home to Arlene’s Interiors, opened in 1972 and in business until the owners retired in 2002. The larger portion used by Shaw Electric Company contains a garage and workshop in back. Shaw Electric moved or closed up around 2010; the building was sold in 2011. Since then the lettering, and even the attached globe lamps, have vanished. 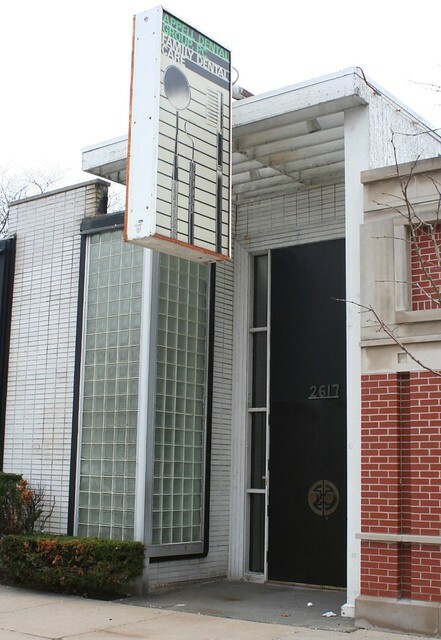 The wonderful 1958 building at 2617 W. Peterson was also remuddled within the last few years, with the glass block panels replaced by open glass. The insertion of the large vertical beam indicates some kind of roof failure was underway. 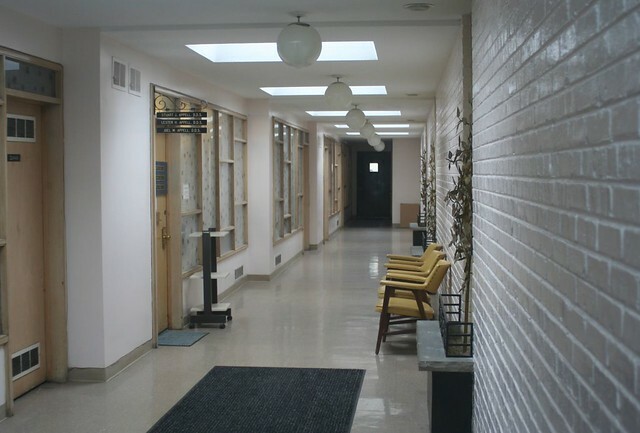 Opened in 1958 as “The Office Promenade”, 2617 Peterson was touted by its marketers as “excitingly different”. 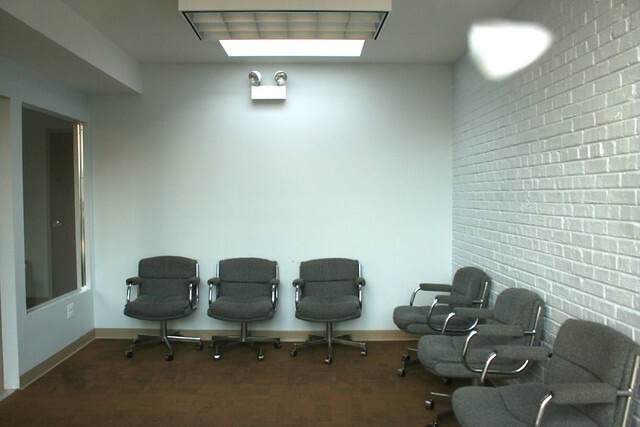 Special features included natural light from the skylights and individual Hi Fi systems and air conditioning in each office suite. More recently it was home to Appell Dental Group, PC; they left around 2010. 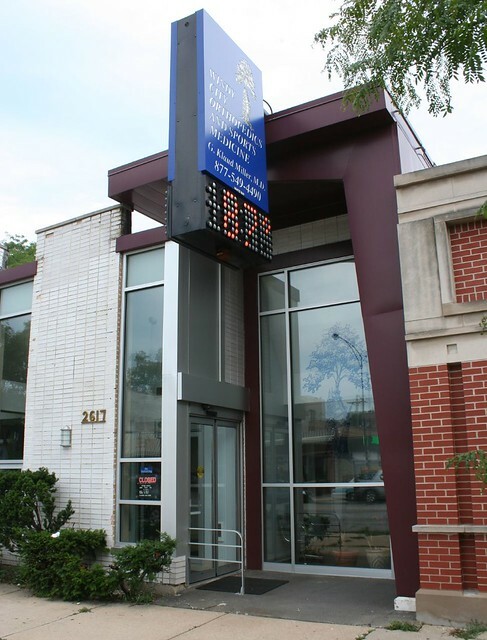 The post-remuddle occupants are Windy City Orthopedics and Sport Medicine. Despite these and various other afflictions, Peterson Avenue still retains a great deal of Mid-Century architecture worth celebrating. We’ll look at some of the stand-outs next week. 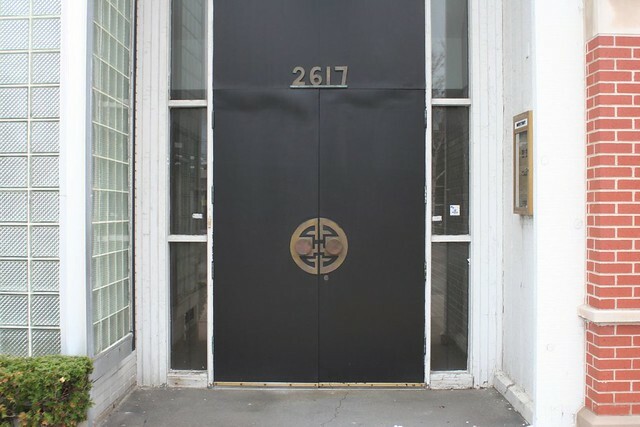 This entry was posted in Commercial strips, Mid-Century Office and Commercial, Midcentury Modernism, Peterson Avenue. Bookmark the permalink. As always I enjoy your posts. It’s a shame about those fabulous front doors. I would speculate, perhaps Americans with Disabilities Act compliance was at issue, especially if the building’s now a medical office? It looks like the replacement is a sensor-activated sliding door. It would have been much cheaper to simply leave the doors in place, locked. 2300 w Peterson the former Furst and Furst agency, check out the winding staircase via the glass front . once there was a statue entitled “Broken man ‘in the well of the staircase. This is really the third blog post, of urs I actually went through. 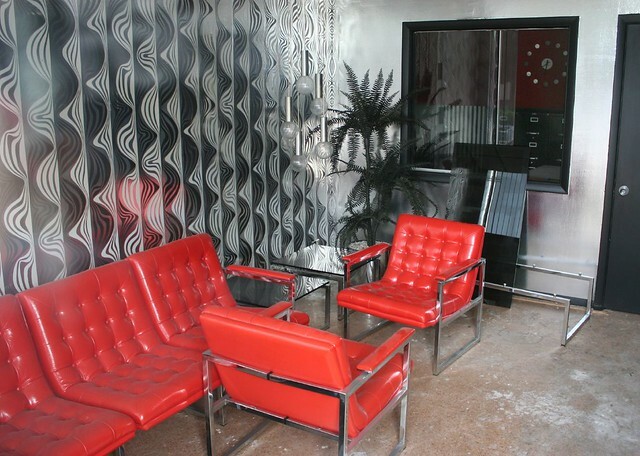 Mid-Century Modernism, Part 1 � A Chicago Sojourn” the very best.